okay so i just looked at my calendar and realized that tomorrow is not Dec 6th !!! it's december 4th ! OMG can you say HUGE error and I feel like such a dork ... SO with that being said the Christmas Open House and Studio Tour has been moved to DECEMBER 11th !!! Class will be from 2-4 with the open house studio tour to follow from 4:30-7:30 - Hopefully that will work better with people's schedules and not in the middle of the day on a Monday ..... Also if you can't make the class the kit is also available too on the website ... So see my website for directions / etc .. I am soo very sorry for the Error !!!! 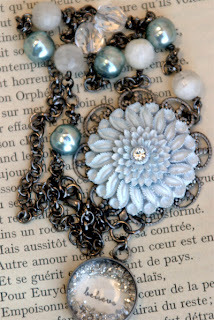 Also don't forget about the giveaway over at the WWC blog ... so head on over and enter !!! and FREE SHIPPING on the Website all weekend long in honor of the 12 days of Christmas !!!!!! I love your necklaces. I would love to win the hero one. Thanks. Your work is so beautiful! I am so happy to have found your blog and just can't stop looking at everything! Thank you for being such an inspiration!